> Responsible as Customer Service Officer at branch’s counter service. > Responsible in processing application of Letter of Administration, Probate, De-Bonis-Non & Resealing through E-Probate System. > Responsible in handling incoming & outgoing mail/ filing/retrieval of all files. > Responsible in handling, recording, submitting & collecting incoming/outgoing letters/parcels/official documents from government agencies, banks, legal firms & others according to internal procedures. > To do immediate search on the files / to contact clients through telephone. > To do follow-up/status of the process files/photocopying documents. > Submission forms/registering caveat/withdrawal at Department of Land & Survey, Sibu. > To deposit office money collection/cheques on daily basis at local banks. > To assist and involve in branch marketing activities as and when required. > To ensure client’s complaint be resolved with proper manner according to procedures. > To attend to any other duties as maybe assigned by the Head of Branch or Superior from time to time. * SPM/STPM / Diploma in Marketing / Finance / Account / Business Administration or equivalentfrom a recognized university / college. * At least two (2) years working experience in related field. * Proficient in Bahasa Malaysia and English. * Able to speak, read and write in other dialects is an added advantage. 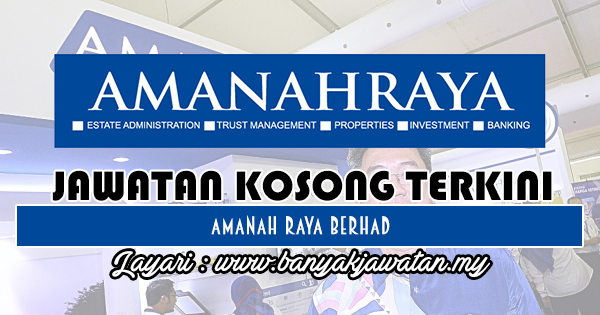 * Good knowledge in Amanah Raya Berhad’s products. * Experience in liaising with lawyers, Government agencies, corporate agencies and financial institutions. * Able to work as a team and cultivate knowledge sharing among colleagues. * Passionate about learning new knowledge and framework and multi-tasking. 0 Response to "Jawatan Kosong di Amanah Raya Berhad - 27 September 2018"